Diplomats are expecting an expeditious investigation. The ambassadors of G7 countries (USA, Canada, Great Britain, Germany, France, Italy, Japan) in Ukraine issued a statement on Wednesday on the situation around the failed detention of Mikheil Saakashvili, the leader of the New Forces Movement. "We are aware that Mr. Saakashvili was detained and that protests are ongoing. We are closely related to developments closely We also expect that any investigation will be conducted expeditiously and in accordance with Ukraine's legal obligations," reads the statement. Early on 5 December, law enforcers came to detain Saakashvili on suspicion of cooperation with the fugitive Ukrainian oligarch Serhiy Kurchenko close to the former president Yanukovych. Saakashvili is suspected of receiving 500 thousand dollars from Kurchenko for the organisation of protests, the Prosecutor-General said and posted a recording of an alleged conversation between Saakashvili and Kurchenko. Saakashvili attempted to avoid arrest by climbing onto the roof of a residential building in Kyiv centre, and threatened to jump, an LB. ua reporter said. He was further taken from the roof and detained. His supporters, however, blocked the passage of the van, broke the rear window and pulled their leader out. 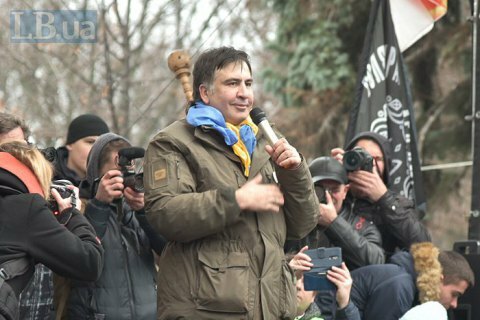 Saakashvili escaped police custody and stays in a rally tent camp in Kyiv. The PGO said he is put on the national wanted list.